Once again, I would like to touch on the importance of being able to identify a particular stone for a customer. A knowledge of stones, even a rudimentary one, goes a long way in making the sale. Customers have more confidence when buying from someone with intimate knowledge of the products they sell. Being able to accurately classify the stone in a ring or pendant at a customer's request breeds trust and adds a level of interest that helps sell the piece. It is the story behind the piece that most often makes the sale. Knowing the stone, having access to spiritual/healing properties and being able to talk a bit about its origin and production method all create an interest and add value for the customer. The list below is a partial index, and focuses on the types of stones most often found in our jewelry. A great book on stones and mineral identification is Gemstones of the World by Walter Schumann. Agate: Agates are found as ball or geode type nodules. Often they have a concentric banding of various colors. Depending on how the stone is cut, the bands may form rings or bands. Agate comes in all colors, and is usually opaque or semi-translucent. The rough surface of druzy is actually the center part of the agate nodule with the rest of the stone cut away. Amber: Fossilized, hardened resin of an ancient pine tree dating back about 50 million years. Found mostly in in the Baltic, younger ambers are found in the Dominican Republic. Yellows and browns are the predominant colors. Amethyst: Type of quartz, found mostly in Brazil. Purple, transparent, color varies quite a bit from light to dark. Most people view dark amy as more desirable. Aventurine: Greenish semi-tranparent stone, similar in color to Jade. Also a member of the quartz family. Sometimes has a glittery appearance, but when used in beads it rarely shows. Carnelian: Member of the Chalcedony species. Reddish brown in color. Translucent to opaque, with color ranging from light to very dark brown. Most carnelian is today is agate that is dyed then heat treated. Chalcedony: Bluish-gray-white milky translucent colored stone. Chalcedony is a species name that includes agates, jaspers, carnelian, bloodstone, chrysoprase, onyx and petrified wood. Stone varies in color from pale gray to deep almost purple blue. Chrysoprase: Green to apple green type of chalcedony. Stone is opaque, often with black veins resembling ferns or other plant-like materials. Citrine: Also a type of quartz. Natural citrine is rare, most are heat treated amethysts. Lemony yellow color, transparent, hard stone. Coral: Branching, skeleton-like material created by small marine organisms. Most often found in red, but also comes in pink, white, black or blue. Soft organic material that must be treated with care to avoid damaging with solvents or hard surfaces. Garnet: Transparent stone that varies from pink to red to brown. Most people prefer the blood red version. Hematite: Black to grayish metallic stone that is very dense. Said to have healing properties, especially in the magnetic version. Jade: The most common and popular color is green, but jade comes in all colors. "New" jade is a whitish color of the mineral. Jasper: Another member of the chalcedony species, it comes in all colors and is opaque even in thin slabs. Jasper is mostly striped or spotted and there are hundreds of varieties. Generally the jasper we get is brownish in varying shades and patterns. Labradorite: Member of the feldspar species. Dark gray to black with colorful iridescence that ranges from yellow to purple. Lapis Lazuli: Dark blue with inclusions of iron pyrite or black flecks. Opaque, this mineral comes from Afghanistan and Pakistan. When properly polished, has a brilliant shine, otherwise has a waxy finish. Malachite: Green, banded stones with parallel lines or concentric rings. Completely opaque, stone is soft and can be easily scratched. Moonstone: Colorless, white or yellowy with a pale sheen. "Regular" moonstone has an opalescent quality that follows the eye of the observer with movement. We mostly get "Rainbow Moonstone," also know as spectrolite. It has a whitish base color with a "fire" inside that varies from yellow to blue. Pearl: Formed by saltwater oysters or by freshwater mussels. Formed as a result of an introduced irritant that is coated by the shellfish with an organic product called nacre that is meant to alleviate the irritation within the animal. Pearls occur naturally in white, pink, silver, cream, golden, green, blue and black. Currently, China is a major producer of freshwater pearls that come in every color of the rainbow (dyed). Peridot: Yellow green stone, transparent. Peridot is considered a higher valued semi-precious stone and is highly prized among stone lovers. It is the birthstone of August, the month my wife was born in. Rhodocrosite: Rose-red to yellowish, usually with lighter colored stripes. Most stones we see are bubble gum pink to raspberry red. Coming from Argentina, this stone has only been commercially produced since about 1940. Most often opaque, transparent crystals are highly prized. Rhodonite: Similar in composition to rhodocrosite, this mineral usually appears more red and has black dendritic (plant-like) inclusions. Rose Quartz: Rosy pink color, usually translucent with a crackled, almost milky quality to it. Rhodocrosite: Rose red with yellow or pinkish colored stripes. Completely opaque, often with a bubble gum color pink. Smoky Quartz: Transparent stone with a black to smoky gray tint. As the name suggests, this is a member of the quartz species. Sometimes called (incorrectly) smoky topaz. Tiger Eye: Another member of the quartz species. Silky, banded brown appearance with an opalescence that changes with viewing angle. In India, they subdivide this stone by primary color, like "Red Tiger," "Black Tiger," etc. Tourmaline: Actually a species unto itself. 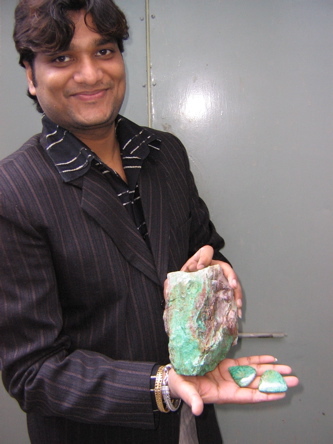 Tourmaline is highly prized and usually expensive. It grows in points like quartz, often with a dark outer ring and lighter center color. The stone comes in all colors, an is semi-transparent. Turquoise: Sky blue to apple green to brown in color, often with inclusions that are dark gray or black in color. American turquoise tends to be more blue in color, while Asian turquoise is green or brown in color.